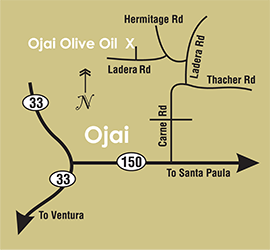 After you turn onto Ladera Road (off of Thatcher Road), stay to the left at the first two forks. You will seem to be going off Ladera Road and onto Hermitage Road at the first fork, but that is the correct way. At the second fork you will veer left, away from Hermitage Road and back onto another section of Ladera Road. After you cross the creek bed at that second fork, you will be on your way up into our little valley. From there on out there are permanent signs marking the way to Ojai Olive Oil. Your next turn will be to the right, and you will see our parking area and green buildings surrounded by olive trees. Head towards the large arched green Quonset-Hut to enter the tasting and shopping area, or to ask any questions about the Tours & Tastings. Our Tours & Tastings begin outside, where you see the picnic tables under a grove of tall old olive trees, then head inside to the olive mill and tasting room.